The NYFD Rolltop is a compact, durable backpack that pays homage to the blue and orange color schemes of NY sports teams. The bag features a waterproof canvas body, dyed black leather patches, baby blue wool felt padded straps, and reflective tape accents that allow the wearer to be visible at night. The reflective tape accenting was inspired by firefighter uniforms and safety vests. Background I’ve always been drawn to the blue and orange color palette of New York sports teams, such the New York Knicks and the New York Mets. Pulling visual inspiration from those sport franchises, in addition to other sources of influence, like New York firefighter uniforms and the Netherlands soccer team jerseys, I set out to design a product that celebrates this iconic visual sports language. ​​​​​​​ Outcome The NYFD Rolltop is a compact, durable backpack that pays homage to the blue and orange color schemes of NY sports teams. 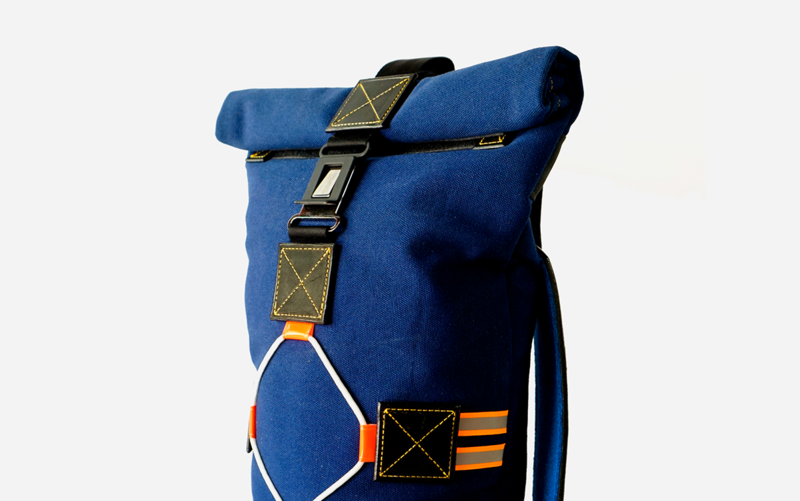 The bag features a waterproof canvas body, dyed black leather patches, baby blue wool felt padded straps, and reflective tape accents that allow the wearer to be visible at night. The reflective tape accenting was inspired by firefighter uniforms and safety vests.